Lately, I’ve been struggling a bit with keeping up on my daily habits and chores (and, obviously, posting regularly here in the blog) – more often than not, I forget to do part of my routine, or space out on some housework I’ve been meaning to do. So, I thought it was about time to revisit an old friend: HabitRPG. Or, as the site is now called, Habitica. Boy, how things have changed since I was last on Habitica! Wow, things have gotten fancy since I last played regularly. There are lots of new costumes, lots of new quests, and so many new quest-related pets – I’ll probably never be able to hatch them all! From level 4, to level 65, and now at level 89! …I’m actually pretty close to hitting level 90, and I’m excited about that. Habitica’s done a good job of motivating me to get things done – granted, I’ve only been back at it for a week now, but I find myself adding to-do items to my list as things pop up (the mobile app really helps with that) and actually working to get things done, so I can make some more progress with quests I’m working on as well as leveling up my character. I really hope I can stick with this, because I’ve actually managed to get a lot done with this extra motivation. Sometimes that’s all my brain needs – a little extra motivation. 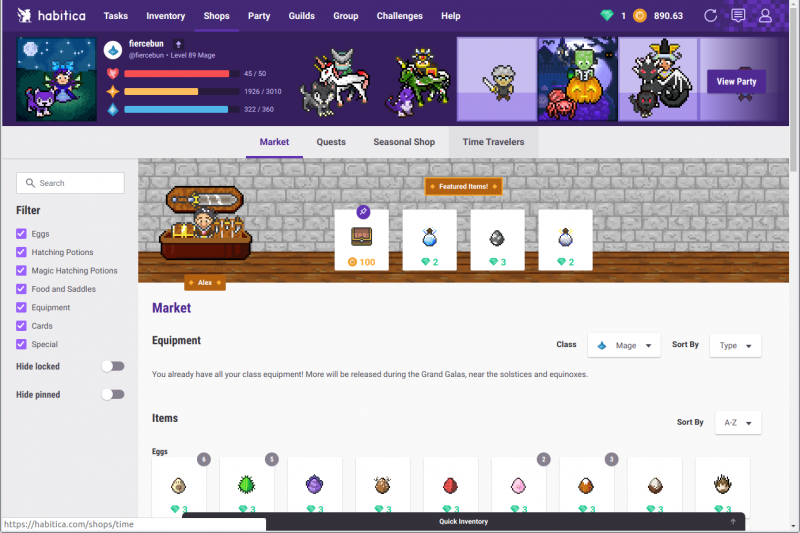 If you need a little boost with motivation and keeping on top of your tasks and habits, but want to have fun doing it, you should check out Habitica. It’s available on the web, as well as for iOS and Android. It’s free to play (but donating or subscribing will get you some extra goodies), and there’s lots to keep you coming back to the site. Four years on, I still recommend it as a great way to help you get things done.